Eminem is to return to the big screen to star in a boxing drama, according to reports. Deadline said the rapper will star in Southpaw as a struggling welterweight boxer who hits rock bottom when tragedy strikes. The film is being written especially for Eminem by Kurt Sutter, creator of US drama Sons of Anarchy. It will be the star's first film role since his 2002 debut in semi-autobiographical movie Eight Mile. Southpaw, a reference to a left-handed boxing stance, will incorporate aspects of Eminem's real music and life. The plot will reportedly follow the boxer's fight to reclaim glory and win back his young daughter. Sutter told Deadline that Eminem - whose real name is Marshall Mathers - was "very interested" in the boxing genre, adding: "It seemed like an apt metaphor, because his own life has been a brawl." "In a way, this is a continuation of the 8 Mile story, but rather than a literal biography, we are doing a metaphorical narrative of the second chapter of his life." Although no production schedule or release date has been set, Sutter said he would begin writing Southpaw immediately and will complete a first draft of the screenplay by February. 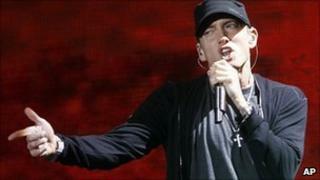 Eminem's comeback album, Recovery, landed 10 Grammy Awards nominations earlier this month, including album of the year.